See what’s on my fridge?!! 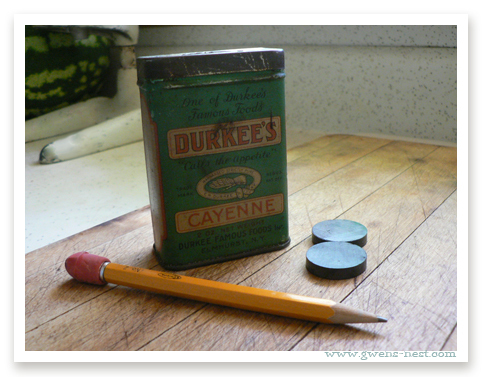 It’s a really cool old spice tin that’s now doing dual duty as decor and pencil holder for my shopping list. My kitchen is postage stamp sized, so I have no space for ‘extras’ and cool decor. Anything I keep out has got to pull its weight as utilitarian. BUT, I needed a pencil cup! And right by the menu/shopping list on the fridge is the perfect place for it, right!? One less thing on the counter in my teensy kitchen. When I saw this post on Pinterest, I was giddy. I love finding cool ideas like this. I already had a small collection of vintage spice tins in a box in my basement waiting patiently for my someday farmhouse kitchen. 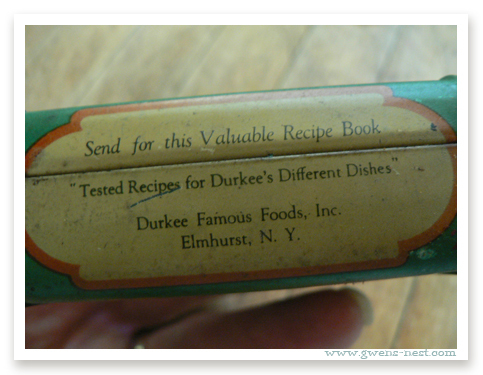 I have this weird affinity for vintage product packaging…the colors, deco fonts, and designs are so very cool to me. Now I can actually USE and ENJOY my spice tins! I ran down and picked out this little beauty. 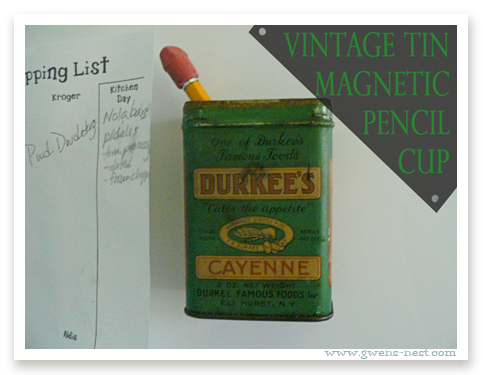 vintage tin, 2 magnets…and a pencil. To go in it when you’re done. 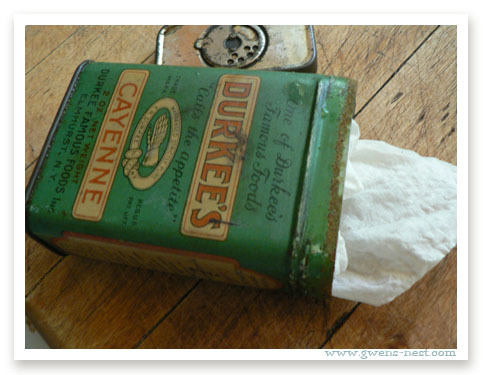 Check out local estate or yard sales, junk shops, or even Ebay for your very own quirky vintage tins. 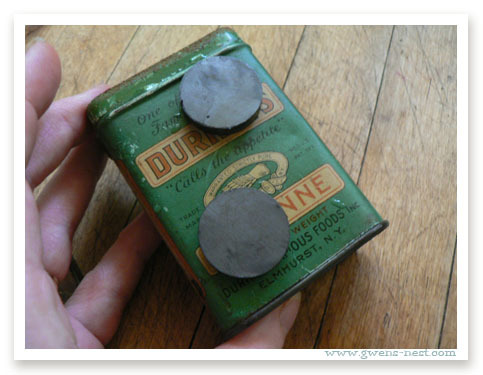 They come in all sizes, from spice tins, to old cough drop tins…to larger cookie and tea sized tins. I even have a really neat old round coffee tin that I used to store coffee filters in. Ohh…lookie! A special offer. 🙂 Back from when addresses didn’t even need street names or zip codes. 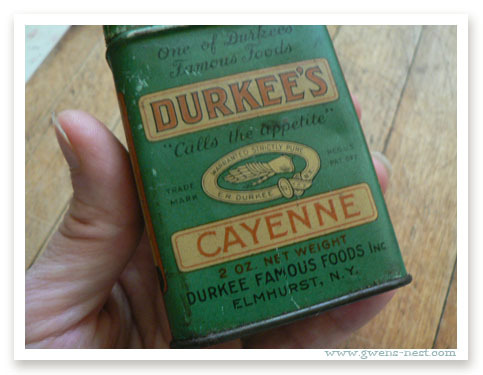 And another bonus inside…antique cayenne pepper. It “calls the appetite”, y’all. Now for a bit of cleaning out and drying it out really well. I don’t want to encourage any more rust. And now for the really hard part: converting it into a magnet. There. See how easy! I just literally stuck them to the tin, and stuck the tin to the fridge. No glue needed. I didn’t want to lose the lid, so I just stuck it inside with my pencil. I think I might need SEVERAL more pencil cups to keep this one company. It’s too cute! Of course, that means that I’m desperately trying to think of other items that I need to store on the fridge. Okay, this is freaking me out a bit. 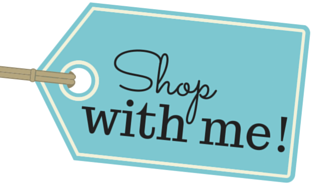 I have that same thing pinned….is your house decorated in vintage/antique? I get giddy over accomplishing…anything! Or having a pencil when I need it! It’s monumental to have a writing utensil. Or scissors, or nailclippers, or tweezers. They are ALWAYS gone! 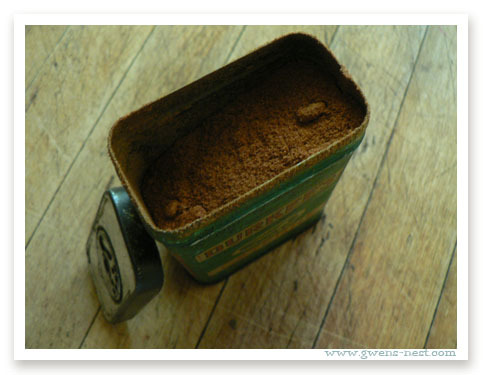 Hey…now I know what I can stash in my other tins!!! Haha!